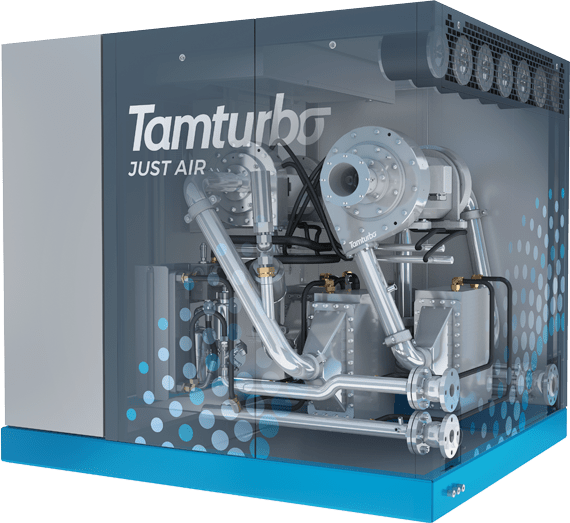 Tamturbo was started in 2010 around the founding idea that the world needs a more environmentally friendly alternative to producing compressed air – we cannot continue wasting our most valuable resources, energy and environment. Our Unique technological advances combined with ingenious engineering work is has brought to life a range of compressors that far surpasses the legacy technologies both in performance and in significantly lower life cycle cost. Our Touch-Free™ technology enables reliable and fully Oil-Free design and eliminates risks of compressed air contamination. In the end, we provide exactly what is needed – Just Air. Born in one of the compressor capitals of the world, Tampere Finland, Tamturbo is expanding its footprint globally through distributors and partners. The compressor product family is complemented by a range of value adding products and services for efficient management of the compressed air production. From mobile container-based compressor rooms to multi-compressor control systems to 24/7 remote monitoring and service so that our partners and customers can feel Care-Free knowing that we have their compressed air production secured! Tamturbo’s vision is to become an independent, medium-sized compressor manufacturer with a turnover exceeding €100 million by 2024. Since the Sixties, Tampere region in Finland has been a birthplace of several compressor innovations – many of which involved Kimmo Laine, the grand old man of compressor technology and co-founder of Tamturbo. Together with Jaakko Säiläkivi, a world-renowned guru in high-speed technology, they shared a vision of an oil-free future. For that they founded Tamturbo in 2010. The future looks bright for Tamturbo’s award-winning technology. The concept of Active Magnetic Bearings was developed in the 1930’s. One of the first applications it was used in was unranium enriching centrifuges in 1940’s. First commercial applications were launched in 1976. Nowadays you can find this technology for example in Maglev Trains, submarines, space shuttles and hundreds of thousands other applications. In this simple technology controlling plays a crucial role. Tamturbo’s know-how enables using it as a core element of Tamturbo® Touch-Free™ Technology. Learn more what our customers have achieved with Tamturbo® Touch-Free™ Technology.